The move is to ensure that only the best performers take part in the International Yoga Day at the Capitol Complex on June 21. The administration has decided to reject all the participants who will fail to perform yoga asanas according to prescribed protocol during the dress rehearsal to be held on June 19. Around 30,000 participants are expected to take part in the one-hour event, out of which 10,000 each will be from Chandigarh, Punjab and Haryana. 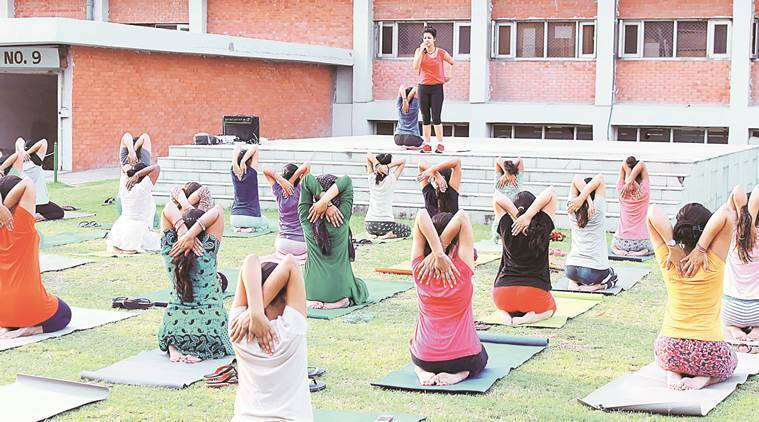 In the run-up to the yoga day, Chandigarh is organising one-month training camps for residents, of which the best performers will be selected for the main event. However, Haryana has organised only a three-day camp, while Punjab will organise training camp for its participants from June 16 to June 20. All the selected participants will take part in the dress rehearsal on June 19. UT home secretary Anurag Agarwal said the performance of all the selected participants will be monitored. “Those who will fail to meet the required standards will be weeded out. We only want best performers at the main event,” he said. He further said the non-performers will be replaced with left out participants who performed well during the one-month camps. The entry to the venue for the dress rehearsal will start by 4am and close by 6am through the only designated entry points, which are to be conveyed by the administration. In order to avoid disruption to the inter-city bus service, the administration has decided not to use Chandigarh Transport Undertaking buses for transporting participants to the venue. UT deputy commissioner Ajit Balaji Joshi, who is the nodal officer of the event, said buses of schools and private transporters will be used and they will be paid for the fuel. “Schools are closed for summer vacations, so the buses will be free. We don’t want any service to be disrupted,” said Joshi. No private vehicles will be allowed on the day. The administration has prepared a contingency plan in case the turnout is below the full capacity of 30,000 at the main event. It has been decided to keep participants at standby at Sector 16 Cricket Stadium, who could be shifted to the venue, if required. The participants will be allowed to carry cellphones with them to click selfies. As a large number of youngsters are expected to take part in the event, the administration will set up a selfie zone at the entrance of the venue. All the participants will be issued Aadhaar-linked ID cards and they will be divided into a group of 50 with one as a group coordinator. The event is being organised by the Chandigarh administration in collaboration with the state governments of Punjab and Haryana.